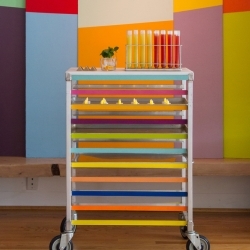 Inter-courses: 3 courses of colorful small bites and cocktails served from a rolling cart. 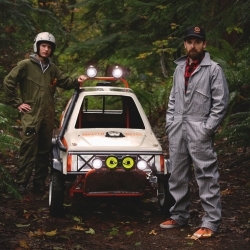 VIDEOVideo by Design Agency Tether Inc. in Seattle, WA RedBull Soapbox Sasquatch story. 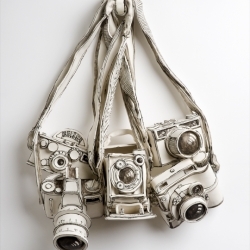 Katharine Morling creates life size ceramic sculptures in porcelain and black stain. 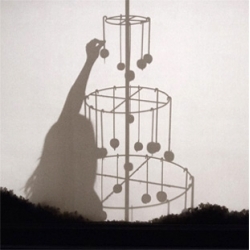 Inspired by her personal narrative, works range from a box of matches to a butterfly box, to a 2m tall tree. 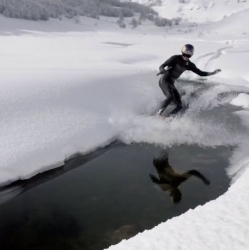 VIDEOBeautiful video of Brian Grubb winter wakeskating. 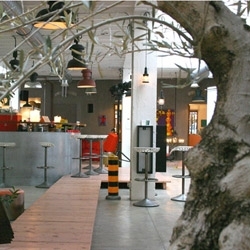 FrenchFlair Audio brings high-class sound at La Platine, the restaurant at La cité du design, during this 9th International Design Fare (France/Saint-Etienne). 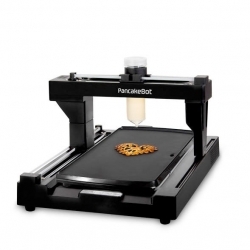 Printable pancakes with the PancakeBot. 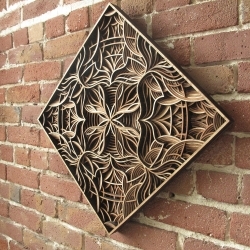 New limited edition laser-cut work by Oakland artist Gabriel Schama. 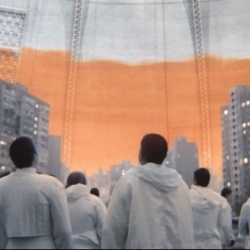 VIDEOThe Dulux Colourless Future campaign by BBH London. 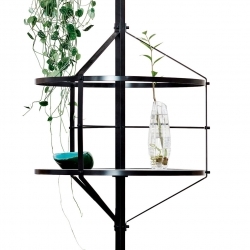 Voliera, an aviary inspired shelf by Pietro Russo. 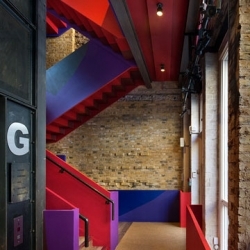 Beautiful remodel of the Donmar Warehouse's Donmar Drayden Street by Haworth Tompkins. 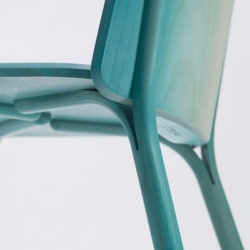 Split leg design series by Arik Levy for TON. 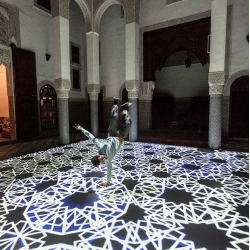 VIDEODigital Arabesques by Miguel Chevalier are beautiful projected interactive installations. 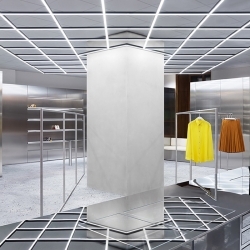 Acne Studios' seventh Stockholm retail space is like a lesson in geometry; lines, planes, angles, shapes and grids. 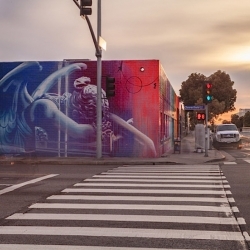 Los Angeles-based streetartist RISK paints new Murals at Sylvester Stallone’s former Santa Monica Studio. 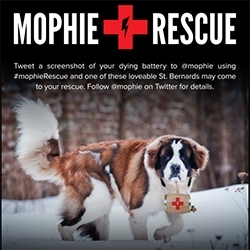 Mophie Rescue St. Bernards will be wandering SXSW this year to help charge up your phone/devices/etc! 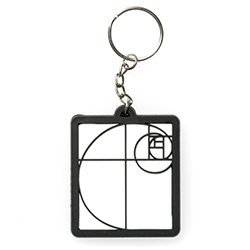 Cute idea... also epic - check out the St. Bernard Rescue Foundation's website - from the 90s? 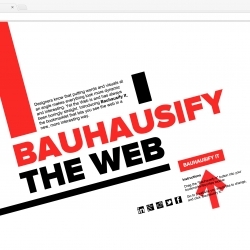 Bauhausify The Web - Putting words and visuals at an angle makes everything look more dynamic and interesting. Yet the Web is and has always been boringly straight. 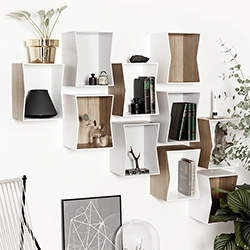 This bookmarklet that lets you see the web in a new, more interesting way. 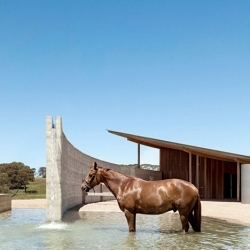 Beautiful equestrian center near Melbourne by London studio Seth Stein Architects and local firm Watson Architecture + Design. 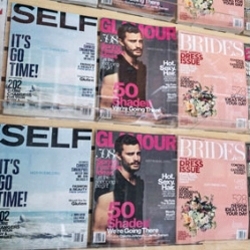 The Not There campaign by Droga5 ad agency on behalf of the Bill, Hillary & Chelsea Clinton Foundation took women out of the picture to highlight gender inequality for International Women's Day. 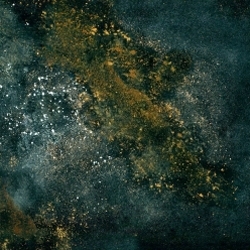 WANDER space probe, a series by Navid Bartay that creates fictional space images using a flatbed scanner. 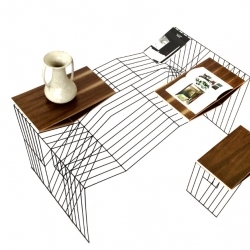 W.Wong, truly modular office draw from its own metal competition. 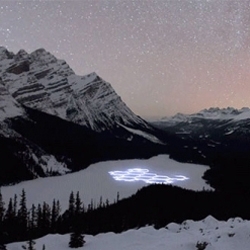 "A line in the outline of an object"
VIDEOSimon Beck's Snow Art in motion in Banff National Park. 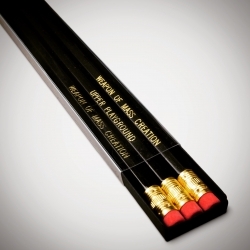 The Upper Playground 'Weapon of Mass Creation Pencil Set" inspired by those who stand for the Freedom of Creative Expression, regardless of one's culture, race or religion. 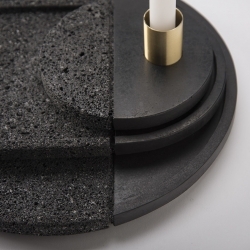 LAVA by Mexican design studio Peca is a set of plates carved from volcanic stone. 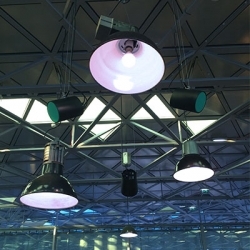 The Clizia series of lamps by Slamp, colored interlocking squares in Opalflex® evokes the story of the mythological nymph who, repudiated by the Sun, becomes Elitropio. 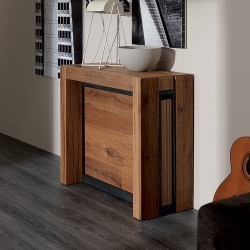 Designed by Adriano Rachele. FOUNDIN, an art installation of tiny figurines planted all over a city is waiting to be found in Toulouse, France this March. 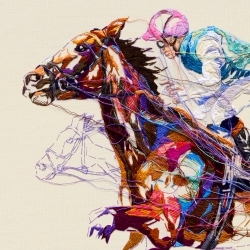 VIDEOAn incredibly detailed embroidery by Lauren DiCioccio comes to life as the centrepiece for London agency Antidote's campaign for Royal Ascot, one of the most prestigious events of the sporting, social & style calendars. 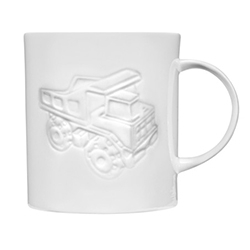 Tom Dixon Bone China Truck Mug - A fine bone china mug in pure white with a glazed finish, developed working with the manufacturing heritage of the Stoke on Trent Potteries. 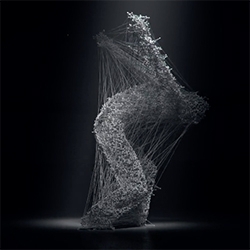 VIDEOas·phyx·i·a from Maria Takeuchi and Frederico Phillips - a mesmerizing video using 2 Kinect sensors to motion capture a choreographed dance piece. The data is then manipulated digital to create the end result. 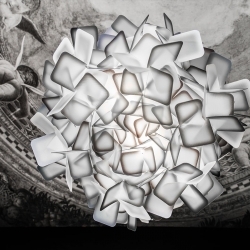 This uplifting design was conjured up by Chris Duffy, working with the concept of levitation and buoyancy. 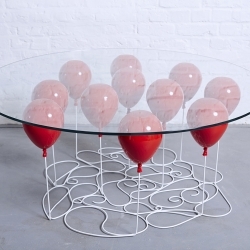 It's a playful trompe l'oeil, giving the impression of a glass table top being suspended by red balloons. For the holiday open house at FRONT, food + art collective Thought For Food designed an edible art installation, A Winter’s Tale - an edible art installation featuring a popcorn blizzard and a twirling tree with hanging caramel apple ornaments. 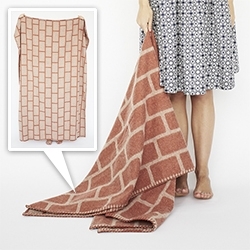 Thing Industries Brick Blanket - 100% wool blanket ready to make anything you drape it over look like brick! 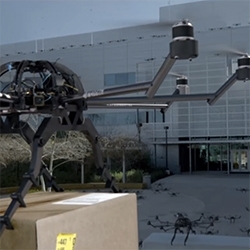 VIDEOAudi's 'The Drones' advert is a fun satirical look at... packaging drones attacking in the style of The Birds? 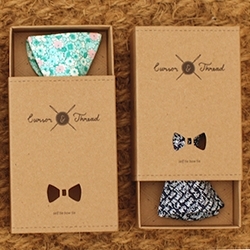 Cursor and Thread has a nice bow tie gift box designed by Ooco Design - love seeing the packaging design and iBox custom dies behind it all. 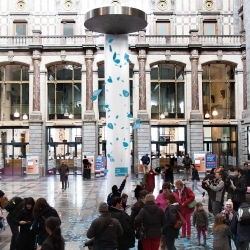 World's biggest compliment shower, created for International Compliments Day 2015, by Antwerp based agency Friendship. 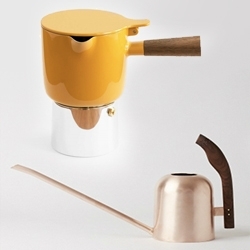 Dream Tools, a new line for the office designed by Eugeni Quitllet for Lexon. A somewhat surreal atmosphere welcomes us upon entering Les Enfants Terribles. 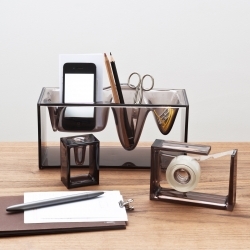 Something reminds us of the painting "The persistence of memory" by Salvador Dalì. 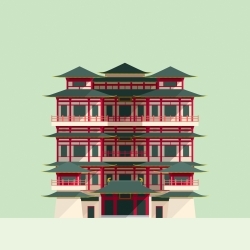 The Sight Project attempts to illustrate the sights of a city, starting from the city that we grew up with — Singapore. Cities are identifiable by its sights and its architecture. 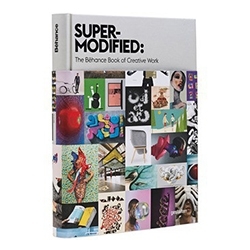 Super-Modified, first ever art & design book to source content exclusively from the Behance community, with a bleeding-edge look at trends driving today’s most exciting creative work. 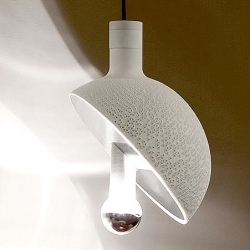 Section - 3d printed modern light designed by Marco Lafiandra: a “cabinet of curiosities” in miniature – part real, part game, part curiosity – capable of revealing every detail of its constituent parts. 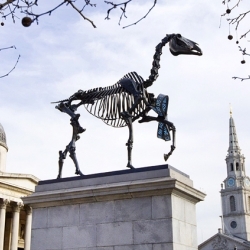 The new controversial Gift Horse by German artist Hans Haacke has been unveiled on the Fourth Plinth in London’s Trafalgar Square. 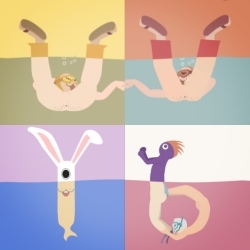 The Pantless Project, collection of 35 animated alphabet characters that are goofy, friendly, bit crazy. 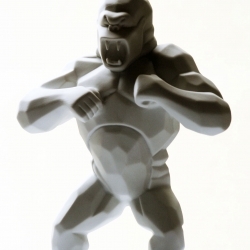 They don’t talk, but communicate through mind and body language.